One of the lowest moments in recent transit history arrived last June when Tom Prendergast faced his confirmation hearing at the hands of the New York State Senate. Instead of offering up anything substantial, Senator Andrew Lanza too up a full ten minutes of Prendergast’s time, barely asking a question. Instead, he ranted and raved against bus lanes, Select Bus Service, and flashing blue lights. Supposedly, even after years of successful service in Manhattan and the Bronx, Staten Island drivers thought that SBS buses, with their flashing blue lights, were emergency vehicles. After a review of the relevant New York State laws, Lanza — who has fought every transit improvement for Staten Island with a vengeance — determined that the MTA’s blue lights violated the law. He lectured Prendergast about the issue even though the MTA had turned off the lights in early 2013, over four years after using them initially and after countless law enforcement officials expressed ignorance at the blue light law. Bus users throughout the city have since complained about the difficulties in discerning Select Bus Service vehicles from the distance as the visual signifiers are no longer obvious. Over the past year, various groups — including Manhattan’s CB 6 — have tried to find a solution. After an extensive review of the law, it appeared as though purple lights would be the only ones that didn’t require some sort of exemption, and for a while it looked like a bill to secure Albany’s stamp would pass. But Lanza started his whining about last summer, and as Streetsblog noted last week, the effort is stalled in committee. CB 6 passed another resolution [pdf] urging Albany to allow for purple lights or the MTA to do something else entirely. Kellner added that he has filed a “Form 99? to push the Assembly’s transportation committee chair to act on the bill during this legislative session, which ends this year. An NYU review of Albany procedure called this tactic “ineffective” because it does not force the bill to be reported out of committee. The push to pass the bill is also complicated by Kellner himself, who has been sanctioned by the Assembly ethics committee for sexual harassment violations and is not seeking reelection this year…. Kellner’s statement speaks volumes about this whole fight. It should not be controversial. Everyone is willing to accommodate a bunch of obstructionist politicians from Staten Island who both complain about a lack of transit options and throw up as many roadblocks as possible over improvements as incremental as Select Bus Service. Meanwhile, the rest of the city’s bus riders are held hostage to the whims of the few on something that is not, again, controversial. How utterly frustrating. I’d love to see what Cuomo would do to a bill authorizing purple lights if it passed and got to his desk. There’s like a 75% chance he’d veto it with some insane explanation about how SBS doesn’t need any help and we really need to help NYC’s poor, abused drivers. Just turn the S79 SBS into Limited-Stop service since it never has SBS off-board fare collection system and almost 50% of the buses does not have SBS wrap on. Waste of money wrapping the S79 buses. Then other boroughs will turn on the lights. Lanza is a douchebag, but are the lights still necessary, now that BusTime has launched city wide? Does every SBS stop have a screen with a bus time stream on it? A huge chunk of people either don’t know BusTime exists or just will fully ignore it. And honestly, having the lights is a nice supplementary thing anyway. Then you have those that are aware of it and would use it but lack the means to do so. Staten Island has always been on the wrong side of the Hudson. Many here share that sentiment, but as stated before – not going to happen. To be technical, Staten Island is not across the Hudson (which ends at the upper harbor near Manhattan) but is actually across the New York Bay. And no need to give it to New Jersey. Before Staten Island made the huge mistake of falling for the bullcrap that Manhattan was shoveling and joined to become “Greater New York” in 1898, Staten Island was doing just fine as a separate county of New York State. Would that keep SI’s New York State Senator from opposing MTA SBS lights? If SI had balked at becoming a part of the city and remained an independent county it’d most likely have abandoned the SIRR and have a much smaller, more poorly funded local bus system akin to Nassau County and wouldn’t have many express buses. It wouldn’t have SBS at all. It also wouldn’t have the Verrazano Bridge sucking toll money off the Island to pay for your subway/bus trip. Or maybe not. The MTA is a STATE agency, not a city dept. And the SIR was bought by the STATE in 1971, not by the city. Again I say, Staten Island was doing just fine before joining with the other boroughs to become Greater New York in 1898. No need to join with New Jersey. Back to my question, if they were still a part of NYS but not NYC how would that keep their representatives from opposing SBS lights in Manhattan, Brooklyn, the Bronx, and Queens? Also, the fare recovery ratio for SI public transit is well below the rest of the city. With the resident discount in mind, SI users of the bridge don’t send the MTA enough money to bring the per rider transit subsidy down to the level it is in the rest of the city. SI isn’t subsidizing the MTA. If you left NYC you’d also lose you’re free ferry. It wouldn’t, obviously. But if you held an entire county responsible for the stupid actions of one politician, then you could blame every citizen in all five boroughs for every dumb idea that comes down the pike. There are many idiot politicians in Kings and Bronx counties too. As for free/subsidized ferries, trains and buses, Staten Island doesn’t have a monopoly on those either. Why this fascination that SI should somehow join up with New Jersey when it’s been a part of New York (colony and state) since the 1600s? It’s ironic that if SI were part of New Jersey, it would have long ago had a direct rail connection into NYPenn. The entire SIRR, and the north shore corridor would have been just another route for NJTransit trains. This is sort of a general response to this subthread, but you guys are missing the point when you talk about tolls and fare recovery. Looking at SI’s farebox recovery leads you to some unfair conclusions. 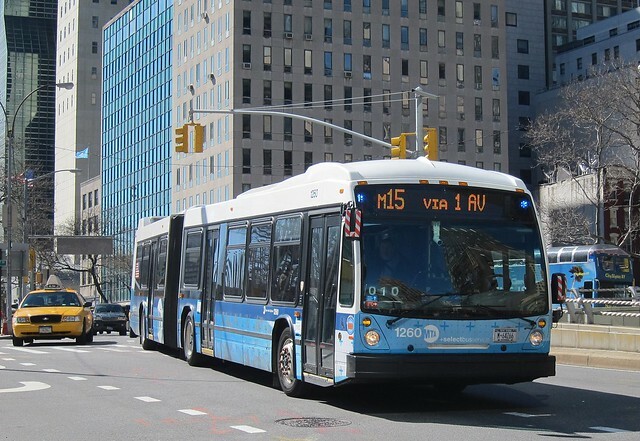 SIRT is reported as a separate system from NYCTA, and naturally only part of the fare recovery SIRT generates for the MTA can be attributed to SIRT – much goes to buses or subways, but if SIRT weren’t there those rides perhaps wouldn’t be generated. So to some meaningful extent, SIRT “subsidizes” the subway and SI buses. In either case, Staten Island probably isn’t effectively pulling its own weight meaningfully more or less. If SI transit is more expensive, it’s probably because of over-reliance on buses, not where the fares are collected. Do the subways have this problem? Oh no, all of the trains are silver! How do I figure out which one is my train?. Seriously, the solution is multi-color destination signs. Works just fine in Albany and other cities. Actually most transit busses today have amber colored signage for better visibility especially at night. Older busses tipicly have a green LCD display. The only agency I’ve sene where both styles are used is TOR in Rockland County. Except that SBS and locals don’t always (or ever?) share stops like subway trains do. Can be a great deciding factor for trips late at night, whether to go to the SBS or local stop depending on which is apporaching. On the S79, most SBS stops are also local stops. In Manhattan, the stops might be on different ends of the same block, or at most a block or two apart. The problem with the lights is that they were very piercing, and you had to turn away as the bus pulled in or risk having a seizure. If they were a steady color, or if they flashed like ambulance/police lights, that would be better. Did anyone have a seizure from these lights? Or are you being hyperbolic? Don’t ambulance and police lights flash much quicker than SBS lights did? Being hyperbolic, but it’s still a piercing light. I don’t feel the need to look away when a police car/ambulance goes by, but I do (or did) need feel the need to look away when a bus pulled in, especially at night. Blue lights can be pretty bad at night. Something more red would be easier on the eyes. Risk having a seizure from lights that flash far slower than police/ambulance lights. Do you realize that you basically killed your own argument with two consecutive sentences? Can’t the MTA come up with another solution, like blinking asterisks added to the edges of the electronic display signage? Instead of “M15 via 1 AV” as shown in the photo above, maybe “*M15 via 1 AV*” with the asterisks as large as possible and blinking? It’s not as good as the lights, but it’s something. I take the M15 occasionally, and without the blinking blue, telling the difference between an SBS and a regular M15 is often difficult until the bus gets within a block or two. This ridiculous red tape over blue lights is beyond absurd. I was thinking that the sign could periodically flash in reverse so that the “M15 SELECT” would be black against a white background. It could just blink maybe every three seconds. If the purple lights don’t require an exemption why does this require Albany’s approval? Is Lanza the only one holding this up? Turn the lights back on, and remove all bus service from Staten Island. Better service for those who want it, millions saved from those who don’t. Oh, but then they would whine about not having service. Like the way they whined about how their buses were older than in the rest of the city. The buses there get beat up all the time, anyway. I live on 2nd ave and use bus time, but sometimes your outside near the stop with a load of groceries in both arms and you don’t want to pull out your phone. As the SBS stop is a 4 blocks further south for me to walk it was nice to have the lights. I could see them over 10 blocks away. It’d be refreshing change of pace if the whiny minority didn’t ruin it for the overwhelming majority. I’ll confess I do own a car, and drive in the city on occasion but never once have I confused an SBS bus for any kind of emergency vehicle. It’s a bus, looks like a bus, moves like a bus in a bus lane. 1) There is something called: “Squeaking Wheel Politics” – is done by political folk of all stripes – it is also called responding to the needs and concerns of the folks that have elected you into office, to those writing letters and complaining. With 75% of the households on Staten Island having a car (or more) issues involving mass transit take on a completely different cast and hue. 2) The folks who use mass transit here (such as it is) are often not the ones to write in and complain to their elected folk, or the ones that garner television or newspaper stories about the difficulties of the transit that exists here. 3) The issues with the SBS-79 Bus especially as it related to creating problems for car drivers made the news and papers here, and the talk! Folks getting tickets due to issues with the bus lanes, etc – drive the news – meaning a political response. Those folks wrote letters, talked to their political folks, etc – they applied pressure. Yes, that is “squeaky oil politics – you do not have to like it, but that is a kind of politics in play in many places. The flashing blue lights are simply a reminder to the car drivers – that “their hated bus” is nearby. And yes, I think it is petty, but there it is. 4) Let’s look in “squeaky oil politics” in Manhattan by looking at the statement, “Kellner’s constituents rely heavily on SBS along First and Second Avenues, and Manhattan Community Board 6 passed a resolution.” Mr. Kellner’s voting base is writing letters, talking to their political folk about their interests, etc. It is simple more Manhattan folk use the mass transit, and fewer own cars – so there is an interest to protect and promote their interests. 4) What politician has never ever played the meme: “Look At What The Gov’t Has Done Now!” – as a way to “fight” or mitigate whatever that is happening that “hurts” the “common man or woman”. Once the SBS-79 Bus and its bus lane issues got shifted into that “hurts” category – building support in the greater public eye is not going to be easy, especially since there are the smaller numbers of folks that actually use and benefit by the service, who often do not write or connect their political folk. 5) Speaking for myself – being an urban planner, being a transit fan, living on Staten Island, and participating in the online forums is often a joy. I am a person who really wants and advocates for transit improvements on Staten Island, as well as the other boroughs. I have lived and worked in every borough of the city – I am a New Yorker! 6) I, however find it tiresome to participate in forums where there are people who believe that the place where you live should not even be considered apart of the city – something that was decided in favor of by the voters of these five counties in 1894. Or who continue to state that there should not be any improvements to the transit on Staten Island, to just be happy that the ferry is free (only since 1997), among some of their other statements. Who know that the bankruptcy of two private railroad companies in the 1920’s would become the determining factor of all future transportation for the next century or two. Staten Islanders are New Yorkers and deserve just as much respect as anyone living in Manhattan, Brooklyn, Queens or the Bronx. 7) I am in no way, defending Senator Andrew Lanza, and I’ve never voted for him – I’m not in his district which covers the majority of Staten Island. However I would not cast him as the devil-on-earth when it comes to transit policies and decisions on Staten Island and/or NYC. I’d quickly plainly cast other folks in the role of the devil-on-earth. A minor devil or demon, maybe, even minor-minor devil – but any higher rank is giving him just too much credit. 8) Here’s the thing that I do not understand. In both Harlem, Manhattan, Queens and Brooklyn there were debates and severe arguments over the SBS bus plans, bus lanes, usages of the streets, etc. Were all of those folks called or condemned as “obstructionist politicians”? Was the same said when various folks wanted to modify, change, remove bike paths, or other recent transit ideas. A whole host of issues, ideas and concerns. With everybody having varying degrees of “right-ness” and “wrong-ness” to their ideas, concerns, passions and energy. Sometimes it is good to cut down on the name-calling, focusing on how to make transportation (as well as plenty of other issues) better for everybody. Yes, they were. They’re obstructing progress and better policies for everyone because of the interests of a diminishingly few well-connected people. At a person who has waited 30 minutes and more for buses on Staten Island in all kinds of weather, I really say without any irony, do not care if the bus lights are flashing or not! All I want is a bus that shows up when it is supposed to, takes me where I want to go in a timely manner, and is as hassle free as possible. That is not too much to ask for! Good luck with that Mike. I finally left Staten Island (and actually moved out of the shithole that is NYC) because of the crappy bus and train service. Best decision I ever made. I would imagine it was only somewhat easier to get service anywhere outside of SI. You’ve obviously never rode a bus on Staten Island and waited 45-60 mins for a bus during weekday rush hours (when the schedule calls for every 15 mins). On the S40 Richmond Terrace route, dispatchers routinely cancel one, two, sometimes three trips in succession to send the ratty old buses onto other routes or “school specials” during the afternoon. You wouldn’t see that bullcrap in Manhattan or Brooklyn. NY can’t even get already existing lights turned on, and you wonder why you can’t get more subway built? Local buses = M15. Select Buses = M150. Problem solved. The MTA renumbered all Staten Island bus routes about 25 years ago, using 90 series for LIMITED versions of local routes (ie: the S61 local is named the S91 limited during rush hours; the S62 becomes the S92, etc). So far as i can tell, it’s worked pretty well all these years. Why are there SBS versions of local routes using the same route numbers when it would be more logical to rename the routes entirely? Because almost all of them are maintaining their old routes (M15 SBS doesn’t really matter too much, but B44 SBS does). Still, I’m actually against renaming mere Limited/SBS variations of routes other than B44 SBS because they artificially increase the number of actual routes when there’s really no difference in route. The only routes I would accept such a measure for are routes like the Q10 Limited, B44 SBS, and S89 (which is already in line with the SI Limited conventions), as routes like these stray considerably from their local services.